Explanation: That's no meteor. While watching and photographing this year's Perseid Meteor Shower, something unexpected happened: a gigantic jet erupted from a nearby cloud. The whole thing was over in a flash -- it lasted less than a second -- but was fortunately captured by an already-recording digital camera. Gigantic jets are a rare form of lightning recognized formally only a few years ago. The featured high resolution color image, taken near the peak of Shikengkong mountain in China, may be the best image yet of this unusual phenomena. The same event appears to have been captured simultaneously by another photographer, further away. The gigantic jet appears to start somewhere in a nearby thundercloud and extend upwards towards Earth's ionosphere. 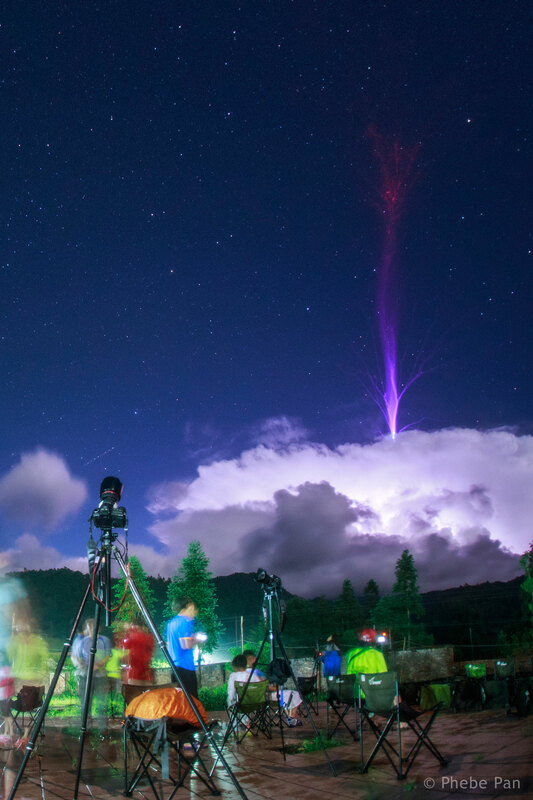 The nature of gigantic jets and their possible association with other types of Transient Luminous Events (TLEs) such as blue jets and red sprites remains an active topic of research.